Time management is very important in BPM, because it allows you to set due dates for the tasks that should be completed. If your organization has many users and the tasks to be completed by each one are diverse, it is preferable to set due dates to make sure that each task be completed in due time and manner. Read below how you can assign due dates to your organization’s tasks, as well as the different ways to assign due dates. When should I define a duration? Defining a duration for your tasks works as a guideline to the users that should complete them. They can see at all times how much time they have left to complete a task, so they will learn to manage things by themselves. Hence, users can control by themselves all the tasks they should complete, without the need that another person constantly remarks that, either by email, phone or in person. If you want to define a duration for your tasks, learn how to do it here. If a due date expires, no automatic action will happen. The task will not be cancelled, but it will be tagged as &apos;Overdue&apos; in your Inbox, in Real-Time Reports and in Custom Reports. All tasks in which a duration has been defined will generate color tags for the user that needs to act upon the task. These tags will appear in the user’s Inbox as well as inside each given task. The green color tag indicates that the due date has not been reached. The yellow color tag indicates that there are less than 24 hs left for the due date to be reached. The red color tag indicates that the due date has already been reached and the task is now overdue. The objective of these tags is that final users can see which tasks they should attend first (red tags), which tasks can wait (green tags) and which tasks should be completed soon (yellow tags). Should you want to, you can sort the active tasks of your Inbox by ‘Due date’. By doing so, you can instantly visualize all the tasks that should be attended first. When should I use interruptive timers? You can use interruptive timers to improve the time management of your processes. Unlike what happens when you define a duration, these timers allow you to set due dates for a task and, once the due date is reached, the task to which the timer is linked will be cancelled. The process instance will now follow the path you have set through the timer. Time will start running once the process instance reaches the task to which the timer is linked. Should the task be completed before the time you have set finishes, the timer will have no effect. This means the process instance will follow what is completed first: the task or the time set. Example: In this case, if the time set through the timer is reached before the user completes Task A, this task will be cancelled and Task A- Manager will be assigned automatically. The due date set by an interruptive timer cannot be seen by users. If you want that final users can see how much time they have left to complete a certain process, then it is advisable to define a duration for your tasks, instead of using timers. If you want to learn how to configure an interruptive timer, click here. If an employee is taking too long to complete a task, you can automatically assign it to his/her manager. If you are holding for the answer of a client/supplier to complete a process and it takes him/her more than a month (or several months) to answer, you can automatically finish the process. Therefore, you will not have ongoing tasks that can distract you from other tasks. If you generate limited time offers, you can configure them to be available for a certain time and, after that time has passed, you can send a new quotation to your clients. When should I use non-interruptive timers? Non-interrupting timers are limited to the Premium Plan only. The major difference with interruptive timers is that, once the due date is reached, the task will not be cancelled; rather, the process instance will follow two paths in parallel. If you want to learn how to configure them, click here. Time will start running once the process instance reaches the task to which the timer is linked. Should the task be completed before the time you have set through non-interrupting timers finishes,** these timers will have no effect**. They are also useful if you want to carry out several actions, depending on how much time has passed since the process instance has reached the task the timers are linked to. For example, you can send an email to a user responsible of not completing a task 3 days after the task was assigned to him/her. After 5 days have passed, you can send an email to his/her supervisor/manager, informing him/her that the task has not been completed. In both cases, the task will not be cancelled; rather, the process instance will run in parallel to all automatic actions triggered by their respective timers. Can I combine interruptive and non-interruptive timers? In this example, we have configured 3 timers. 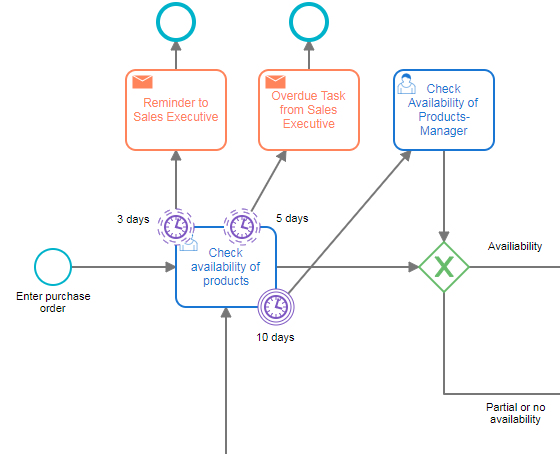 The first one, named ‘3 days’ will sent an email to the user responsible to complete the task ‘Check Product Availability’ if he/she has not completed the task after 3 days. The second timer, named ‘5 days’ will sent an email to the Sales Manager, informing him/her that 5 days have passed since the user should have completed the task and he/she did not. Lastly, the interruptive timer named ‘10 days’ will automatically assign the task to the Sales Manager if 10 days have passed since the user should have completed the task and he/she did not. 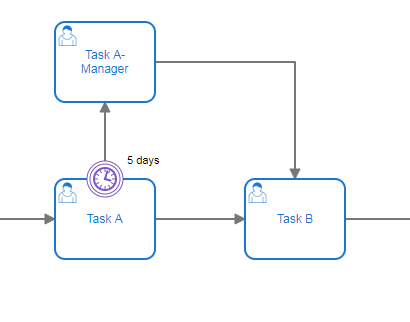 Bear in mind that timers can only be linked to a User Task and there is a limit of 5 timers per task.